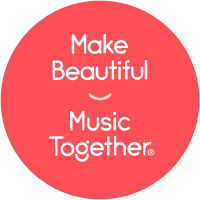 Making Music Together - Register Today! SPRING CLASSES HAVE BEGUN! Tuition is prorated automatically. CELEBRATING 15 YEARS IN TORONTO AND 30 YEARS INTERNATIONALLY! Learn more about our CLASS FEES and be sure to read our REFUND POLICIES before you register. Classes are automatically PRO-RATED for remaining dates when you register online (materials cost is NOT prorated). * A FULL 45-minutes of singing & dancing to one our 9 fabulous Song Collections each week! Next up - the TRIANGLE Collection! * CD & Digital music files to have songs on the go with our free "Hello Everybody" App on your devices. * A beautifully illustrated, newly re-designed coordinating Songbook with family activities to enjoy at home. * Access to the fun activities & info on the Music Together Family Zone website! * An infant Sibling under 10 months at the start of the class can come along for FREE!